During his WWDC 2004 keynote, Steve Jobs said: "We started off in 1984 with this great metaphor of 'you put things in file folders', and a few years later we all had a lot of file folders. "Now, you have a zillion file folders and you can't find anything. It's easier to find something from one of a billion websites on the web with Google than it is to find something on your hard disk." Freeing people from the command line's geeky tyranny made the process of file manipulation easier, but it also created problems: a need to constantly manage hundreds of nested folders, and the inability to easily find items when amassed files are many. Furthermore, fixed locations are restrictive - items are housed in one place, unless you make copies, at which point synchronisation becomes a concern. A two-pronged attack has finally loosened the desktop model's grip on user file management, and the first 'prong' fittingly had its popular origins online. In 2001, Joshua Schachter created Memepool to collect interesting links, but as their number mushroomed, it became clear a folder system was unusable. To wrest order from chaos, Schachter wrote links tagging app Muxway, freeing himself from archaic, single-location models, and enabling link collections to be collated via assigned keywords. Muxway became del.icio.us - now Delicious - and as users increased, collective decisions regarding item categorisation became intelligent and relevant, an organic system since dubbed 'folksonomy' by Thomas Vander Wal. In recent years, tagging has exploded, via image tags on Facebook and Flickr, Gmail message labels, and Twitter hashtags, providing users with the means to define personal collections of items and the ability to see the bigger picture via tag clouds and trends. On the desktop, information is more personal, but the inability to find and organise information when there's so much of it remains problematic. But during the aforementioned WWDC keynote, Jobs stated Apple had already solved this problem via iTunes's search field enabling users to find songs via metadata. System-wide application of this idea became Spotlight, an interface for finding local data in a natural manner. With Spotlight, users can find items by keyword, date, file type, or a combination of criteria. Since Spotlight delves into file contents and creates its own tags, a query for 'Paris' may return location data, contacts named Paris, PDFs with 'Paris' in, and more. During his demonstration, Jobs claimed Spotlight would "revolutionise how we use computers," adding: "A lot of us are never gonna use Finder again - we're just gonna [use Spotlight] to find anything." And he was right. 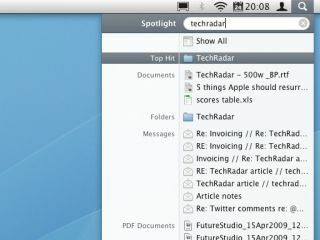 Mac users are as likely to use Spotlight to launch items as Finder, and with Spotlight being system-wide, it's quicker to run Spotlight searches in Mail to find messages than to explore nested email folders. Logically, filing subsequently becomes redundant - it's simpler to follow the internet's 'never delete' model and rely on search to locate items. And although Apple seemingly pays lip service to file folders via 'Smart Folders' (saved Spotlight queries), these are merely a familiar face for a modern, dynamic methodology. After all, Smart Folders are effectively the Mac OS X equivalents of tag links. In a recent blog post, Steven Frank wonders whether the files and folders interface will be turned off entirely should Spotlight become advanced and popular enough. That sounds far-fetched until you consider the proliferation of 'folksonomy', and the fact tagging and a Spotlight-like search now exist in Windows. Ultimately, interfaces only survive until something better appears. In an interview for MIT's Technology review, Schachter claimed: "For a system to be successful, the users of the system have to perceive that it's directly valuable to them." In today's world, no-one cares about filing, and the ability to rapidly create distinct groups of information from seemingly arbitrary files and pieces of content makes the digital equivalent of the paper-based approach seem positively archaic. So although folders aren't quite dead yet, they're certainly on borrowed time.